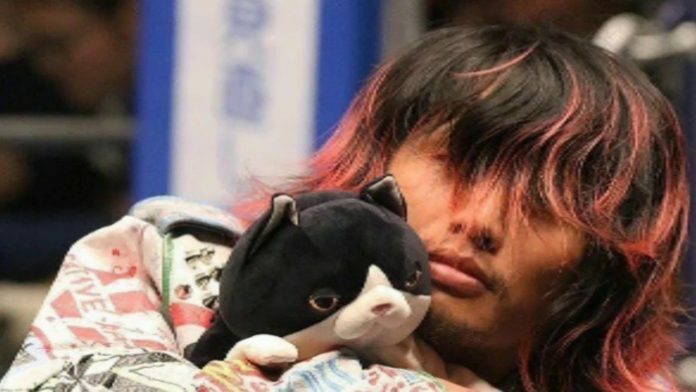 The inanimate toy cat of Hiromu Takahashi’s has sent out an update on the IWGP Junior Heavyweight Champion’s condition. Hiromu was dropped on his head during the G1 Special in San Fransico. It was reported he collapsed in the back after finishing the match and was taken to hospital. Updates from New Japan Pro Wrestling on his condition have only stated he was conscious and sitting up in the hospital and has now flown back to Japan. A Twitter post from Hiromu’s account appears to show Darryl Takahashi holding up a sign with an update from Hiromu. While the sign states that Hiromu is fine, it also shows an illustration with his head severed from his body. So, it’s tough to know exactly what they are trying to communicate here. Dave Meltzer of the Wrestling Observer Newsletter also noted he heard that Hiromu will not require surgery, which is also a positive sign. IWGP United States Champion, Juice Robinson, also commented on Hiromu’s injury recently. Robinson made his comments during an appearance on Jim Ross’ podcast. Up until his injury, it had been a career year for Hiromu. He won the 2018 Best of the Super Juniors en route to winning the IWGP Junior Heavyweight Championship for the second time.